On these pages you can see more evidence of how much power is being used. To meet the demand, to pull the needed power out of oil and water and coal, America’s turbine engineers have been swamped with work. 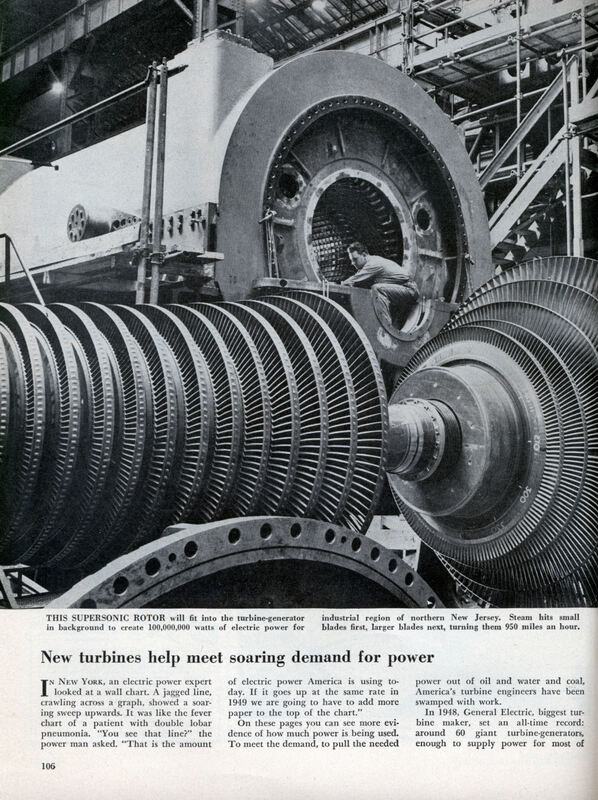 In 1948, General Electric, biggest turbine maker, set an all-time record: around 60 giant turbine-generators, enough to supply power for most of the. 7,000,000 residents in the state of California. With power needs approaching 6 billion kilowatt hours a week in 1949, compared with around 4.3 billion in 1946, G.E. this year will open at Schenectady, N. Y., one of the world’s largest factories, a $30,000,000 turbine plant: a sort of Willow Run for the power industry. Trend in turbines is toward higher speeds and higher pressures. 1940 turbines roared under 1,300 pounds of steam per square inch; today’s newest machines whirl faster than sound at a terrific steam pressure: one runs at 2,300 pounds, or over a ton against every square inch of its blades. 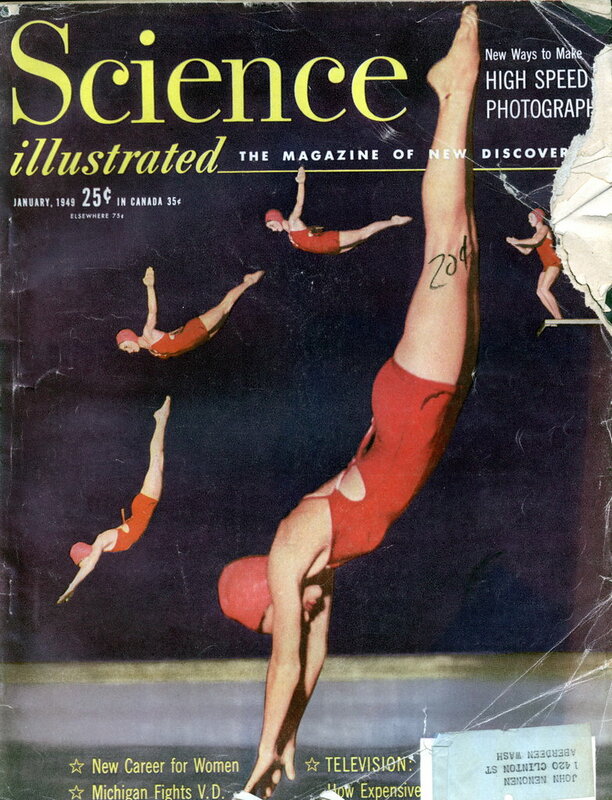 In 1949, G.E. plants in Pittsfield, Mass., and Portsmouth, N. H., will use turbine-generators driven by mercury vapor, which may be more economical than steam. (These are now used in Kearney, N. J., Hartford, Conn., Schenectady.) In time, atomic energy will unleash new hurricanes of vapor in these turbine windmills. Main reason for the tremendous power demand is that there are 6,000,000 more power users in the U.S. today than when the war ended. SECRET-KEEPER Burgess Smith uses no labels on the bottles Smith, who thinks bank checks can be made to talk (see text). in his laboratory, identifies their contents by smell or taste. mistrusts labels and files, and so keeps most secrets in his head. An idea for the future: checks that talk? IN Rochester, N. Y., one of the world’s top experts on printing and engraving has been playing with an exciting idea. Your checks may some day carry a hidden sound track, and your own voice may protect your bank account from forgers. It hasn’t been perfected yet, but Burgess Smith, research chief for the Todd Co., which prints forgery-proof checks, says preliminary laboratory work indicates it can be done. When you write a check, you also speak identifying words. When the bank passes your check through a sorting machine your voice okays the check. It will also be possible to record your voice on a sound track concealed beneath your handwriting; if the writing has been changed, additional words become audible by a secret method. Over a period of years, the Todd Co. has brought out one invention after another for protecting checks, payrolls and securities. The first, in 1899, was the familiar “protectograph” which presses the numbers into the fibers of a check so they cannot be altered. Machinists and metallurgists are beginning to hear about a gray metallic powder which makes a blade of soft steel become hard enough, in a few seconds, to cut through tough tool steel. Now a mechanic or amateur can dip a tool of ordinary low carbon steel in powder and produce a tool that will cut satisfactorily and resist battering. A dime-store drill, or a home-made chisel fashioned from “poor stuff,” is heated cherry red, then dipped into a powder named by its inventor “Hi- Speed-It.” Bubbling and fusing, the powder is drawn into the metal—and seconds later the tool is ready. The inventor, Samuel Necamp, New York metallurgist, makes the compound of expensive alloys, but what the constituents are and how he puts them together he hasn’t disclosed. Unlike earlier hardening preparations, this requires no bath, contains no cyanide, is non-poisonous. In his laboratory, recently, and in a test at Columbia University, Necamp showed what “the stuff,” as he calls it, will do. Until recently, Necamp produced only limited amounts of his powder, but this year plans large scale production. Among his customers are such varied industries as American Can Co., Wilson & Co., U.S. Rubber and Bethlehem Steel.